Half Ironman cookies - as delicious as they are cute! Completing a Half Ironman has always been on my bucket list and I'm lucky to have friends that are dear and crazy enough to agree to come along with me. After hearing the Chelanman race sets up a rope to follow during the swim instead of the usual sighting that is required on the swim portion, we were in. 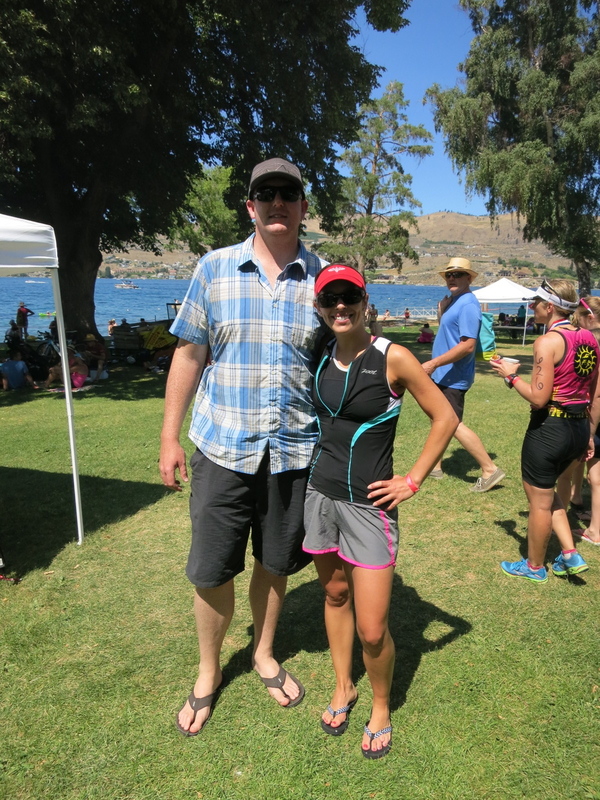 It didn't occur to us to think of what the weather would be like in Chelan during July, we forged ahead. My training started in January and I worked with an amazing coach. A great group of other triathletes were also using coach Julie and we met weekly for running and swimming workouts. I loved collecting all the tips and tricks from other athletes and learning how far I could push myself. Leisurely Saturday mornings with Eric were traded for early mornings spent biking around Lake Washington followed by a run throughout Wallingford or Fremont. Saturday afternoons were spent trying to rally to go out with friends in the evening, and usually there was a massage in order to walk normally! It's amazing what the body can do. By the time Chelanman rolled around we realized it would be around 100 degrees on the day of the race. We had done a training trip out early in the Spring so knew what we were getting into on the bike (3 mountain passes in the last 20 miles) and that the run was on rolling hills. We headed out with our respective cheering teams and were greeted with cloudless skies and a very well organized event. We started taking salt tablets and counting out our Nuun tablets to make sure we had enough electrolytes. There was also a lot of water freezing trials to see how we could possibly keep our water cold at the beginning of the bike and run. The morning of the race was already hot. Starting out on the swim I was nervous being surrounded by 250 others but soon settled in and follow right over the rope that had lured us originally to this course. Stroke after stroke went by and all of a sudden I was in T1. Quickly getting everything on for my bike I was off for the next 58 miles. The course followed the lake for the first 40 miles and I loved getting to see my husband cheering as I whizzed by. There's nothing like having a spectator to get you to check your posture and ride even stronger. The 3 mountain passes were long, hot and lonely. There were no spectators and the riders were all pretty well spaced by this part. I focused on rationing my water and trying to keep eating food and having enough salt tablets. Finishing the bike strong my legs felt every footstrike of the run. After T2 I have never felt to tired and my favorite leg of the race - the run - seemed the longest. There was not a sliver of shade and every step hurt. I committed to not walking and enjoyed each water station to pour ice cold water down my shirt. I would be dry in the next mile - it was that hot! I was delighted by the people on the road that sprayed us with garden hoses and those that pulled up along a long stretch with water guns to spray us from a boat (thanks Fank!). As fast as it started, 6 hours and 14 minutes later it was over. Eric met me at the finish line and I promptly ran into the water with all my clothes on. Showers after races are always the best - I was a mess of sweat, sunscreen and body markings. Maybe the only thing better was the beer we enjoyed celebrating the first and last half ironman I'll ever do. I finished 3rd in my age group and 18th out of all the women. It was around 99 degrees throughout. Most importantly we all finished strong and had a great night celebrating a huge success of completing a goal.